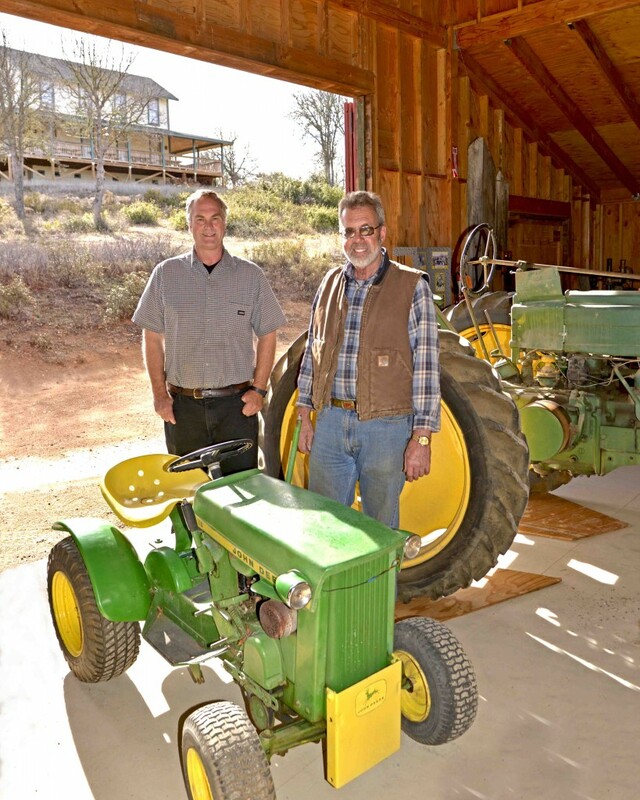 Erik Andre, local landscaper and Lake County native, has donated a 1966 John Deere 110 garden tractor to the Ely Stage Stop and Country Museum in Kelseyville. Andre acquired the tractor five years ago from Steve Sherwin, current proprietor and vintner of Sherwin Family Vineyards in St. Helena. At the time, Sherwin owned Windflower Island and the tractor sat on the property falling into disrepair. Sherwin and Andre struck up an agreement whereby Andre offered to restore the tractor to its original 1966 condition. Sherwin gave him the tractor and the restoration process began. Paul Dennet was the original owner of the tractor. Dennet homesteaded Windflower Island over 50 years ago. Andre remembers visiting the island as a child and being transported to the island’s play area by a wagon pulled by this tractor. Imagine his delight when he discovered it still in residence on the island, though no longer operational. Andre is pleased that the restored tractor has found a new home at the Ely Stage Stop under the direction of Greg Dills. He looks forward to knowing it is on display for visitors to enjoy and for use by museum docents and volunteers for ground maintenance on the property. Hopefully his donation will spur similar donations from other Lake County past or current residents. The museum is run by Lake County Historical Society volunteers who are dedicated to caring for these important pieces of Lake County history. The museum and these pieces of our past are maintained so the public can learn about Lake County’s earlier days. If you have a potential donation, please contact the museum at 707-533-9990 or send an email to elystagestop@gmail.com. Remember that donations to the Ely Stage Stop are tax deductible. Stop by the museum at 9921 Soda Bay Road (Hwy 281) in Kelseyville (near Clearlake Riviera, just north of Hwy 29-Kit’s Corner). Current hours of operation are 11:00 AM to 03:00 PM each Saturday and Sunday. Join us on Saturday, April 12th for a whiskey tasting with Steve Beal, Keeper of the Quaich, Senior Master of Whisky for DIAGEO, the world’s larger producer of whisky, including Bulleit Bourbon & Rye, George Dickel Tennessee Whiskeys, Johnnie Walker Scotch and many more.